There are lots of android applications which makes us easy to use android device. Different android users use different apps and games in their mobile and tablets according to their needs and interest. We have received many notifications from these apps and games, some notifications are useful for us but there are many unnecessary notifications like advertisement. While using others app unnecessary notifications disturb us. Now you don't worry about it, here I have described how to get rid of these unwanted notifications. 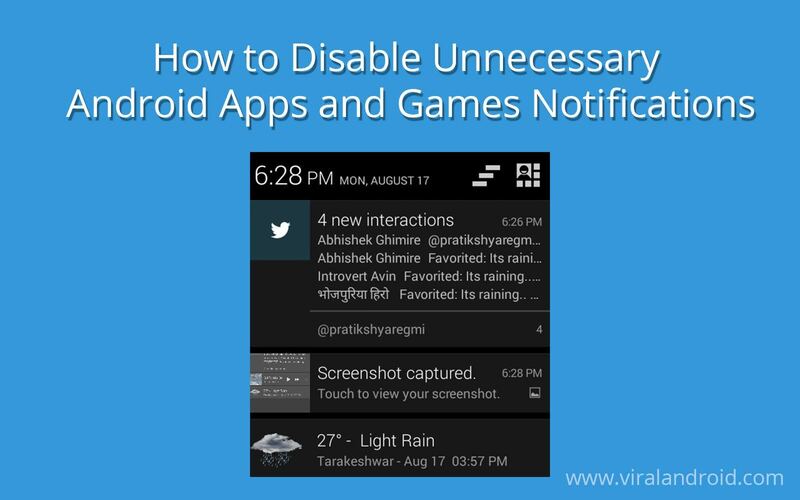 You can turn off any app and game notification from your android mobile and tablet, you just have to follow the following steps. Here I have used the YouTube application as an example to disable notification, you can follow same way for others application and game. Note: You can only disable android apps and games notifications if you are using Android 4.1 Jelly Bean and above device. Step 1: Open Settings menu from your device home screen. Step 2: Hit Apps or Manage Apps from Setting menu. Step 3: Hit any apps you want to turn off notification. Step 4: Uncheck the box "Show Notifications" and hit ok button. Step 5: If you need notification you can re-enable notification by checking the box "Show Notification". Just drag and drop the application whose notifications you want to turn off in to App Info and follow the above steps.